What Does it Take to Get Ahead Now—And Stay There? High performance has always required shrewd strategy and superb execution. These factors remain critical, especially given today’s unprecedented business climate. But Rich Karlgaard—Forbes publisher, entrepreneur, investor, and board director—takes a surprising turn and argues that there is now a third element that’s required for competitive advantage. It fosters innovation, it accelerates strategy and execution, and it cannot be copied or bought. It is found in a perhaps surprising place—your company’s values. Smarts: In most technical fields your formal education quickly becomes out of date. How do you keep up? Learn how the Mayo Clinic, Stanford University women’s basketball team, and others stay on top by relentlessly pursuing an advantage through smarts. Taste: Clever product design and integration are proxies for intelligence because they make customers feel smart. But taste goes further into deep emotional engagement. Specialized Bicycles calls it “the elusive spot between data truth and human truth.” How can you consistently make products or services that trigger these emotional touch points? 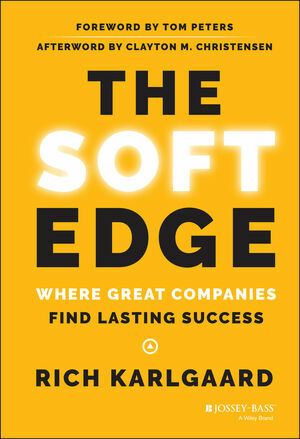 Story: Companies that achieve lasting success have an enduring and emotionally appealing story. What’s your company’s story? How do you tell it your way? Gain the ability to create a powerful narrative in a world where outsiders often exercise the louder voice. Rich Karlgaard is the publisher of Forbes magazine and author of its “Innovation Rules” column. He has been a longtime panelist on cable TV’s most popular business show, as well as a successful entrepreneur; Karlgaard co-founded Upside magazine, Garage.com, and Silicon Valley’s premier business forum, the 7,500-member Churchill Club. He is a past regional winner of Ernst & Young’s “Entrepreneur of the Year” award. Karlgaard, a Stanford graduate, resides in Silicon Valley. For more information, please visit RichKarlgaard.com. —John Ortberg, senior pastor of Menlo Park Presbyterian Church and author of Who Is This Man?